Have you ever wondered what life is like on a US Air Force Base? The 514th Air Mobility Wing invites you on a demonstration tour with Chaplain, Captain Daniel Kamzan. We will show you the real “hurt locker” (Explosive Ordnance Disposal) and the K-9 unit (drug sniffing dogs and attack dogs). Judge Advocate General (JAG), Public Affairs, and others will give briefings. We will meet at the Princeton Center for Jewish Life (70 Washington Road, Princeton, NJ) at 12:30pm. The tour begins at 1:30pm at the base. 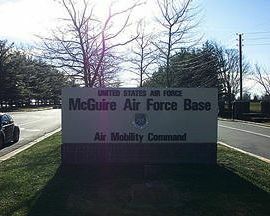 Departure from the base will be around 5:00pm. For more information and registration please contact Chaplain Kamzan, Arielle Greenwald, or shoot us an email at jgap@princeton.edu! This entry was posted in Past Events by Shilpa Nadimpalli. Bookmark the permalink.